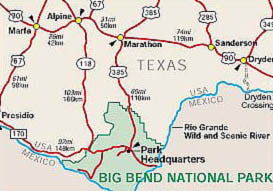 Big Bend National Park got its name because a large portion of the Chihuahuan Desert and the Rio Grande River are looping to the south and form a "Big Bend" in the border between Mexico and Texas. - Big Bend National Park has an amazing variety of plants and animals. Some of the animals that live in Big Bend include; mountain lions, jackrabbits, kangaroo rats, roadrunners, golden eagles, coyotes, black bears and many more. - The diversity of life in Big Bend National Park is amazing and has to do with the changes in elevation, ranging from a dry and hot desert to cool mountains to a fertile river valley. The climate in Big Bend National Park may be considered extreme. The dry and hot summer days often exceed 100 °F. Winters are normally mild, but sub-freezing temperatures can sometimes occur in Big Bend. Welcome to fun things to do in Big Bend National Park! There are many fun things you can do and see in Big Bend National Park. 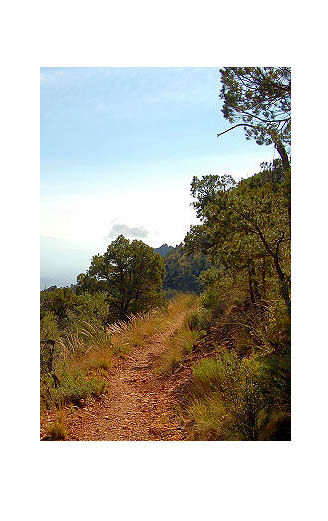 If you start strolling down our website you will find helpful information about lodging, camping, hiking, riding and rafting in and around Big Bend National Park. The campgrounds are open year round. Campsite occupancy is limited to eight people and two vehicles, or one RV plus one vehicle.